When I interviewed Kristoffer Gildenlöw last year, he told me that his debut album Rust was inspired by a dark period in his life. A period that he needed to come to terms with. His next album, the one I’m listening to for the umpteenth now, would be less dark he expected. To some extend he was right, but The Rain is far from party music. The concept album tells the story of a man fighting his oncoming dementia, giving in only shortly before dying. A theme that is all to common, in a world where we are still dealing with Alzheimer. From that perspective, giving some tracks of the album their first airplay during Rock against Dementia on March 19th of this year was a logical thing to do. After the sounds of rain, the first violin notes of After the Rain Part II (Part I is on the 200 copies limited edition bonus EP) make clear that this album is full of emotion and melancholy. 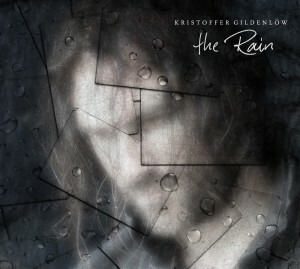 Kristoffer’s voice carries the melancholy, which is joined by Paul Coenradie’s equally emotional guitar to set the stage for the rest of the album. The short piano (Fredrik Hermansson) and male vocal piece Worthy found me staring out the window into the dark of the night, ‘waking up’ to the slightly faster violin (and cello?) of Holding On Pt II. This leads up to the slow See it All, which starts with dark drums and then a piano to accompany Kristoffer’s low voice, again joined by the choir – putting down the emotions of the dementing man wanting to see it all once more. The cello (Maaike Peters) and violin on Peripheral Memory, accompanied by a low guitar riff and almost haunting drums (by Gazpacho‘s Lars Erik Asp) lead to the soft, slow Breath In, Breath Out. Here, the man gives in, knowing the end is near. The piano and Kristoffer’s voice give me shivers, reminding me of family members who died, no longrer aware of who they themselves and those around them were. With The Evening, which starts small and ends big, and the acoustic It was me, the album works it’s way into the haunting Drizzle. This song starts with a very low voice (Norman Ebecilio) and the sound of chains and cart wheels and develops into something that is not a blues but certainly has the feel of one. A very dark one that ends in the sound of rain. The complicated melody of the instrumental second half of She is one of the highlights of the album for me – with a lead role for the alt violin. After this, three short tracks All for You, and The Funeral Pt I and II remain, reflecting the sad ending to a sad story – with the piano and the sound of rain and distant church bells ending the album. An intricate composition, where lyrics, vocals melodies and instruments work together as an orchestra to convey a story. Production of the album is crystal clear, making all the layers of the music shine through. Highly recommended, but requires attentive listening. This review is dedicated to my uncle Josef (Sjef) Hulshout, who is going through the final stages of his earthly life – no longer aware of who he has been and how he has lived.